Friends since first year at High School, the Dubster DJ’s Steve and Brian had always obsessively swapped compilation tapes. Lovingly spliced together, with a hard thought out playing order always at the forefront of their minds. 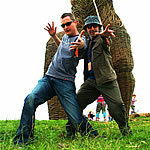 Switching from the legendary “The John Peel Tape and File Project” where old Peel shows were the order of the day to championing unsigned artists via podcasts exclusively with “Unsigned Radio Dubster”, they have reached their logical conclusion with their shows on Dandelion Radio under the guise of Radiodubster.